Zach Lesher: Hi, my name is Zach Lesher. I'm a confessional Lutheran and serve as an elder at Christ Lutheran Church in Stevensville Michigan. I really began to study theology heavily more than ten years ago and I've just never stopped. My favorite areas to participate are apologetics and teaching others the plain truths of scripture. During the day, I serve my neighbor as a self employed contractor/carpenter and I love to lift weights at least five days a week. I am the husband of one wife of 14 years and God has blessed us with two amazing children. My main focus in life is centered around Christ in word and sacrament and to confess the truth of Christ crucified for sinners as I carry out my daily vocations. Pastor Hoffman: Hello, my name is Brandt Hoffman. I live in Coos Bay, Oregon where I serve as both the Pastor and School Administrator at Christ Lutheran Church and school I have been married for nearly 28 years and I have two sons. I came to faith in a small Lutheran Church in Alaska in 1992 and I have never looked back! After serving in many vocations such as Graphic Artist, Denatal Assistant and Computer Programmer, I finally ended up at Concordia Seminary in St. Louis. After graduation I served a congregation in Anchorage Alaska for 7 years and from there I accepted the call to serve at Christ Lutheran. My favorite part about being an LCMS Lutheran is the wonderful, straight-forward simplicity of the Christian faith. We are called by the Holy Spirit to faith in Jesus Christ as Lord and Savior. Christ has given us the Church in orfder to receive God's wonderful grace in both Word and Sacrament.  Being a part of Lutheran Stuff - NO DRAMA is such a wonderful upportunity for me to share the wonderful faith we have in Christ Jesus. I hope you'll continue to join us in our joyful, yet informative studies in the Christian Faith! If you want to be a part of our growing family on facebook, just click Here to join.